If you ever had any doubt that a DC sports curse existed, the fifth inning of last night’s NLDS game between the Nationals and Cubs should have erased all doubts. National’s manager Dusty Baker made the right decision to walk a patient batter for one who swings at nearly every pitch, and like clockwork, Nationals ace Max Scherzer struck him out. Except he didn’t. An almost improbable series of events then transpired. There was a passed ball, a throwing error, catcher’s interference, and a hitter was struck with the bases loaded. I’ve never seen anything like it, but in context, it made perfect sense. 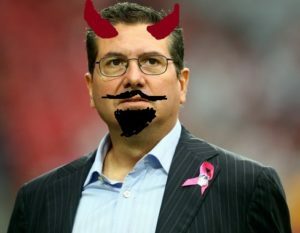 Washington DC sports are cursed, and the cause of that curse is Washington Redskin’s owner Daniel Marc Snyder. Daniel Snyder was not born. He congealed in a pit deep in the bowels of hell. And on the fateful night of November 23, 1964, a demon stuffed him fully formed into his mother’s womb. DC sports have always been the great unifier in a city gripped by division. It didn’t matter if you were a greedy Republican, an effeminate Democrat or a noble Whig, you cheered for the home teams, and you were rewarded with success. The Bullets and Redskins combined for four championships in 15 years, but Satan knows that division and discord are the key to his conquest of the earth, and you have to give it Old Scratch, he isn’t in any hurry. And until that hell-spawn is removed, DC sports will remain damned.